This 6-week bodyweight training program is designed for fit athletes interested in bodyweight-focused training. You’ll train six days a week for six weeks, totaling 36 training sessions. Training sessions are scheduled for Monday through Saturday. Sundays are rest days. This is a total body strength and conditioning training program. 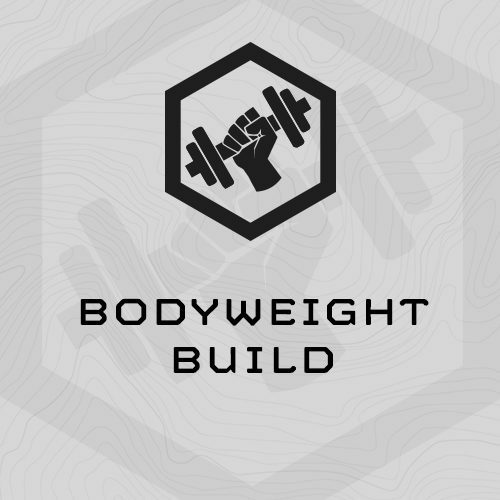 It includes bodyweight strength training (upper, lower, core), intense work capacity efforts, and tactical-inspired endurance (running and ruck running). Optional – GPS Watch – this will make running and ruck running distances easy. (1) Strength/Work Capacity/Core – These Hybrid Sessions begin with focused strength training, followed by a 5, 10 or 15 minute hard work capacity effort, and finish with a core/mobility circuit. (2) Work Capacity/Core – Longer work capacity effort (20-30 minutes) followed by an long core-strength grind. You’ll finish with some durability/mobility work. (3) Endurance – We deploy two general endurance sessions. For rucking running, your focus will be improving “Speed over Ground.” Week 1, you’ll take a 3-mile ruck run assessment. Then once per week, you’ll complete, hard, fast 1-mile ruck run intervals based on you assessment completion time. For running, you’ll complete long, slow runs at an easy pace. You’ll complete long runs (8-10 miles) on Saturdays during the plan. How fit should I be before beginning this program? This is an intense training program only appropriate for very fit athletes. We strongly recommend athletes complete Bodyweight Foundation prior to beginning this plan. This plan is specifically designed to follow Bodyweight Foundation. Optional - GPS Watch - this will make running and ruck running distances easy. 6x Eccentric Pull Ups - 5 Second Drop. Sprint to the rest each round.